Ever since our trip to the city of Bath in England a few years ago, when I see lemons, I think of Spring. This may seem like a strange association but stick with me, and I will explain. 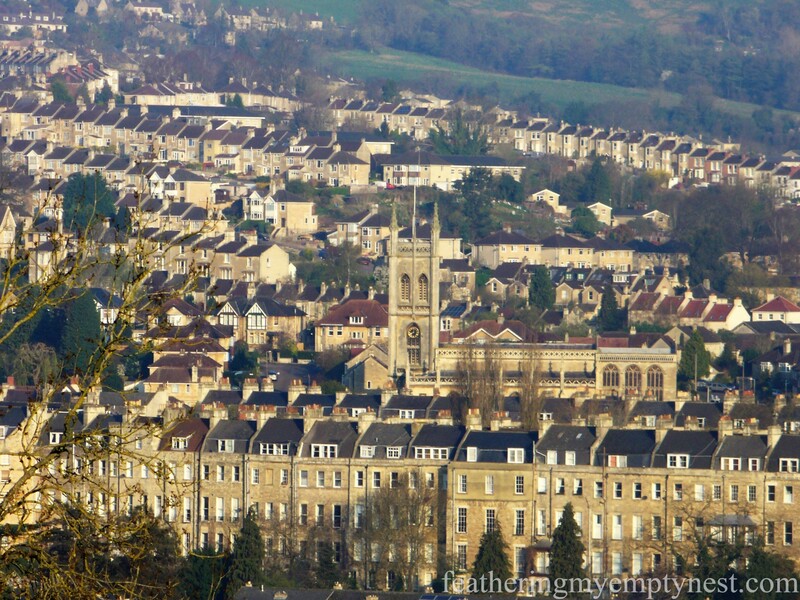 Bath was just one of the cities we toured when visiting my daughter during her semester abroad. 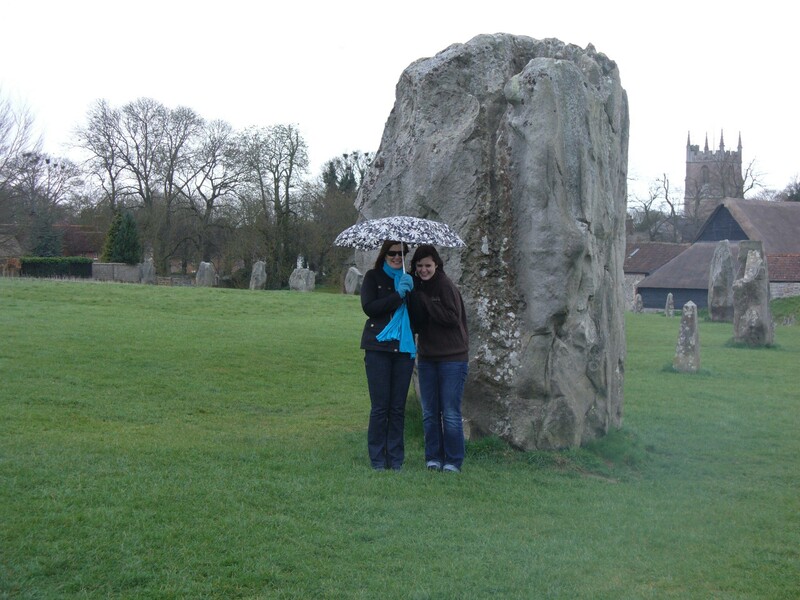 While it was a wonderful vacation, we quickly confirmed all the guidebooks’ warnings about the cold and rainy spring weather in England. I joke that the photos we took on that trip are just a series of shots of my daughter and I shivering and looking bedraggled in various locales. For most of our trip, we were buffeted by cold winds and rain, and Bath was no exception. However, the second day of our stay there dawned relatively warm (low 50’s) and partly sunny. Our B & B was located on the hillside opposite the city. You could walk out of our room onto a patio perched atop terraced gardens to take in the panoramic view of the town across the valley. Little bistro tables dotted the patio, and despite the less than ideal weather, they were serving breakfast al fresco. A simple arrangement of stacked lemons graced the center of each rustic table, and after all the dark skies and cold rain, these small cairns of fruit stood out on the tabletops like sunbeams. The lemons coupled with planters of yellow pansies, the terraced green gardens and the gorgeous view of the brilliant white stone Georgian buildings made such an impression on me. 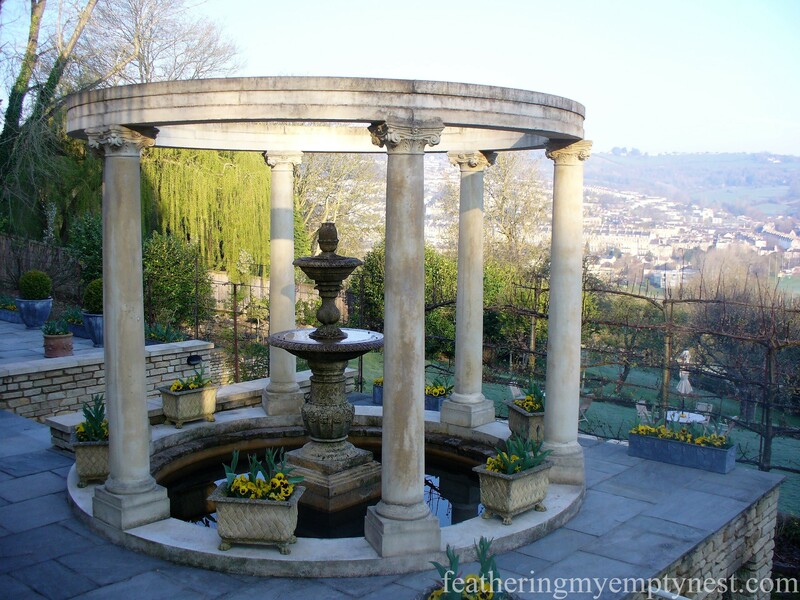 While I was awed by the opulence of the English palaces and inspired by the architecture of the cathedrals, it was breakfast on this patio in Bath that stays with me. It was the England of my fantasies. It was a promise of a fresh and verdant Spring. It was pure happiness. 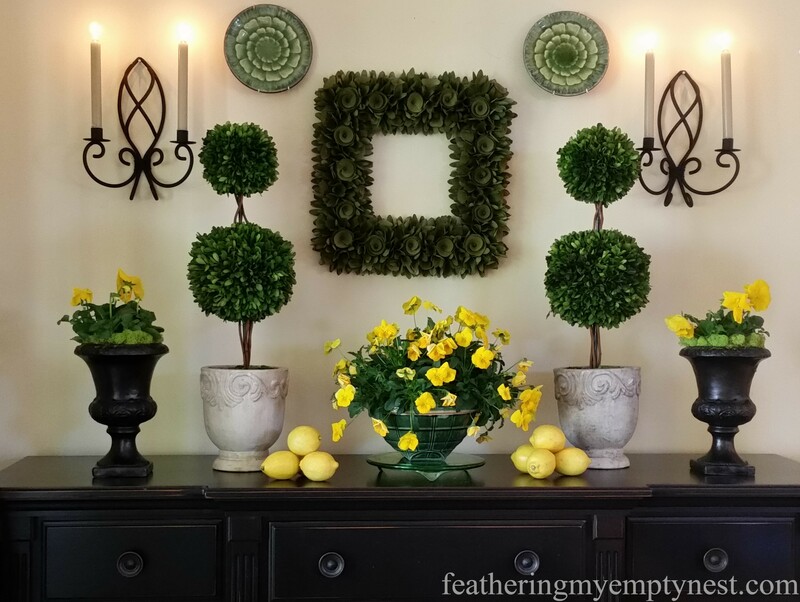 So when I set out to create a Spring Tablescape, I knew I wanted to recreate that morning in Bath with sunny lemons, yellow pansies and lots of greenery. I decided that I would set the table in my kitchen because I wanted this to be a relaxed, casual family dinner. 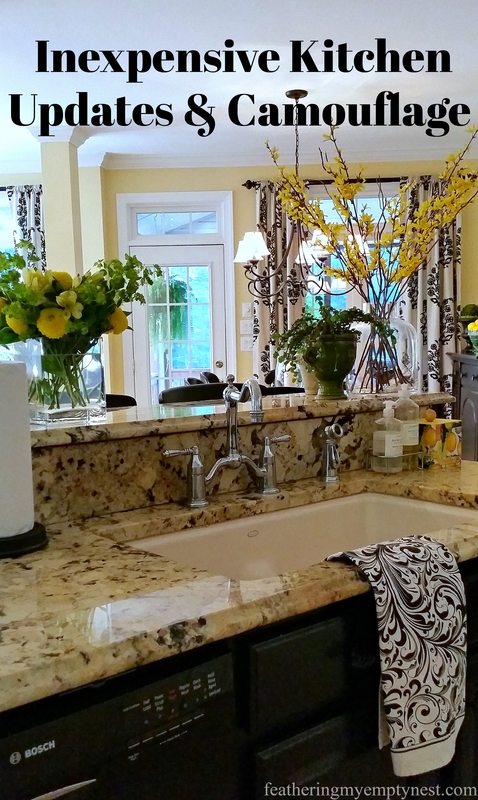 I began by creating a runner with several pale yellow printed tea towels laid end to end down the center of the table. 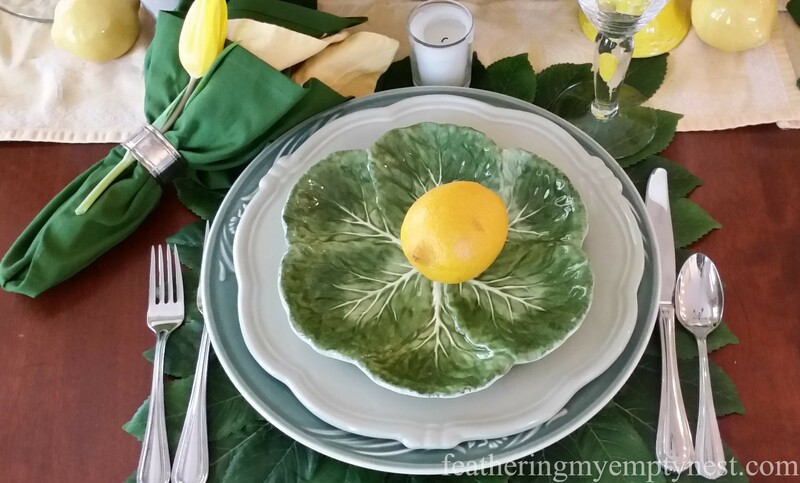 I then added lemon leaf placemats from Pier One and two different colored napkins banded together with silver napkin rings and yellow tulips. 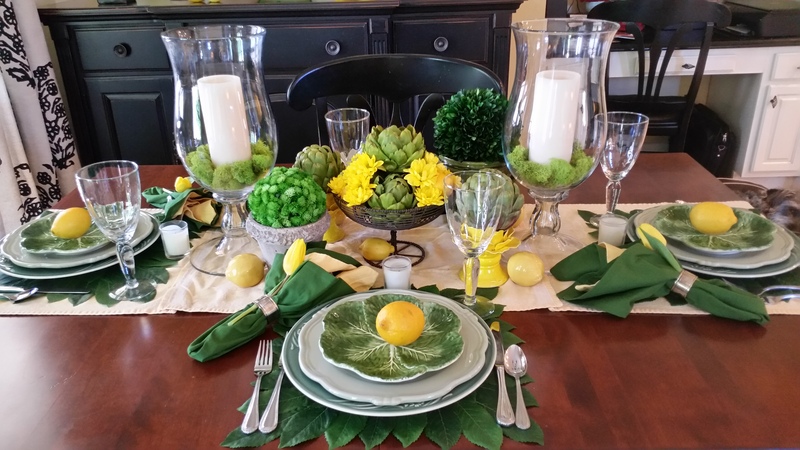 Fresh lemons add a yellow pop to a trio of plates in various shades of green. Not being capable of leaving well enough alone, I had to include my buffet area in the design. I replaced the framed red ceiling tile that usually hangs over the buffet with a green wood curl rose wreath and a pair of green plates. On the buffet, I placed an antique glazed bowl planted with vibrant yellow pansies set atop a vintage pressed glass cake plate. To complete the symmetrical arrangement, I flanked the bowl with stacked lemons, boxwood topiaries, and urns planted with more pansies. Because this was to be a dinner, I wanted to have candlelight. To this end, I used hurricanes with ivory pillar candles and reindeer moss, as well as votives at each place. 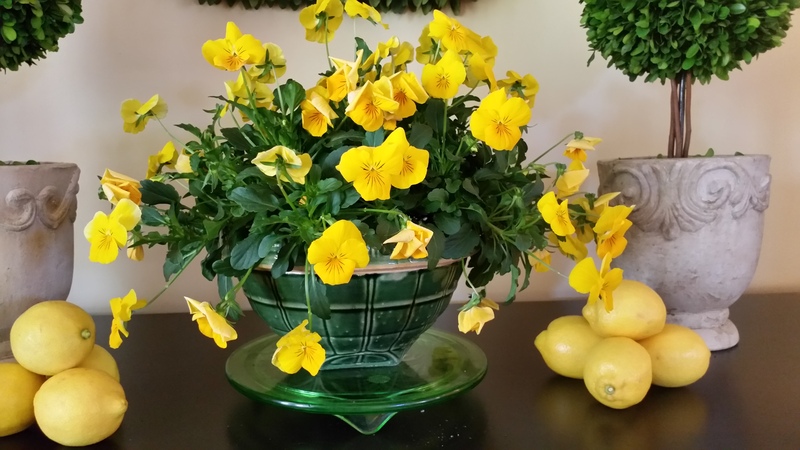 Antique glazed bowl planted with vibrant yellow pansies sits atop an antique pressed green glass cake plate. Artichokes, lemons, and yellow daisies in a wire footed bowl, pots with greenery balls and more artichokes on top of bright yellow candlesticks complete the centerpiece. My lemon tablescape takes me back to that spring day in Bath and makes it feel like spring no matter what the calendar says. What will I do with all the lemons after my dinner party? I’ll make lemonade, of course. Oh my gosh this is a lovely tablescape! I love lemons too! The contrast between the yellow and the green is so fresh. It has been a crazy winter, I’m ready to move on. Thank you for bringing me Spring on the table. Thank you. We will think spring even if they are calling for snow in North Carolina this weekend. Positively beautiful!! Love the pop of yellow with the green. Have a great weekend!! Thank you so much. I hope you have a great weekend too. Great tablescape. Cute idea with the lemons. Love the greens, so perfect for St. Patty’s Day. Thank you so much for your comment. We definitely have to do what we can to bring a little spring into our lives with this crazy winter weather we are having. Beautiful table and I also love the contrasting colors. A trip to the Cotswolds is definitely on my bucket list — maybe even during 2017. I have always loved photos and movies set in that area. I love your tablescape and buffet decorations. 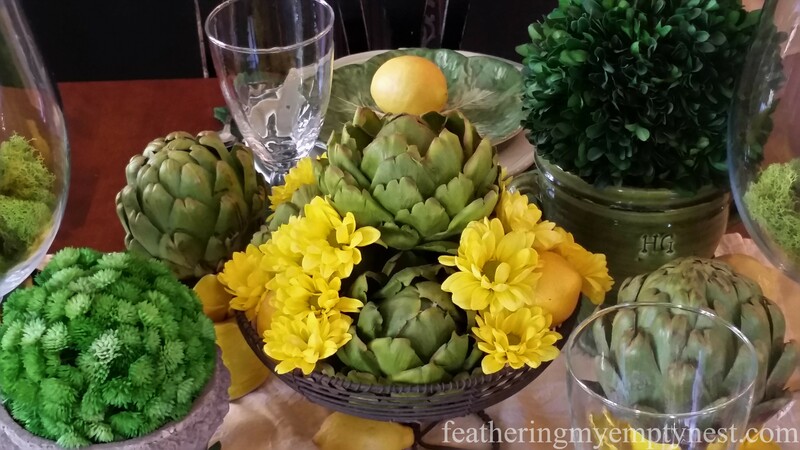 I never would have thought to combine artichokes with the yellow daisies and lemons — but it works perfectly! 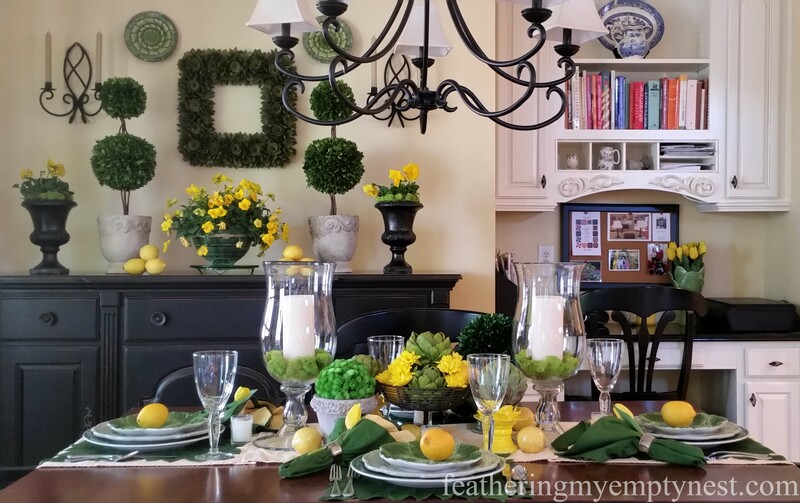 The pops of yellow and green throughout your dining room are so attractive! Just right for spring or even for St. Patrick’s Day (which is today). Cheers! 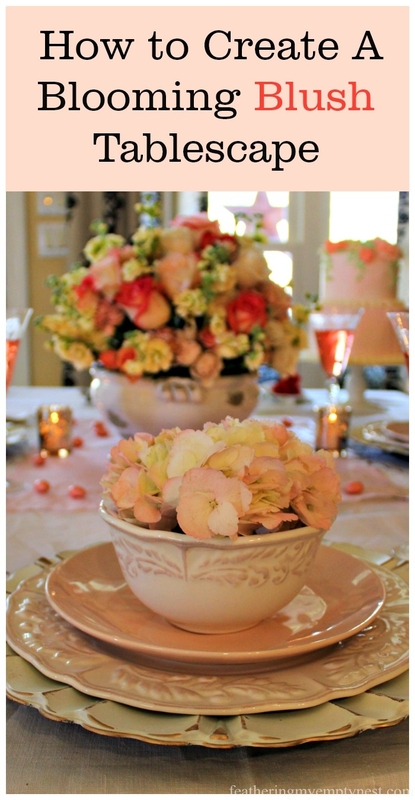 Mimi, thanks so much for your kind remarks about my Spring Tablescape. 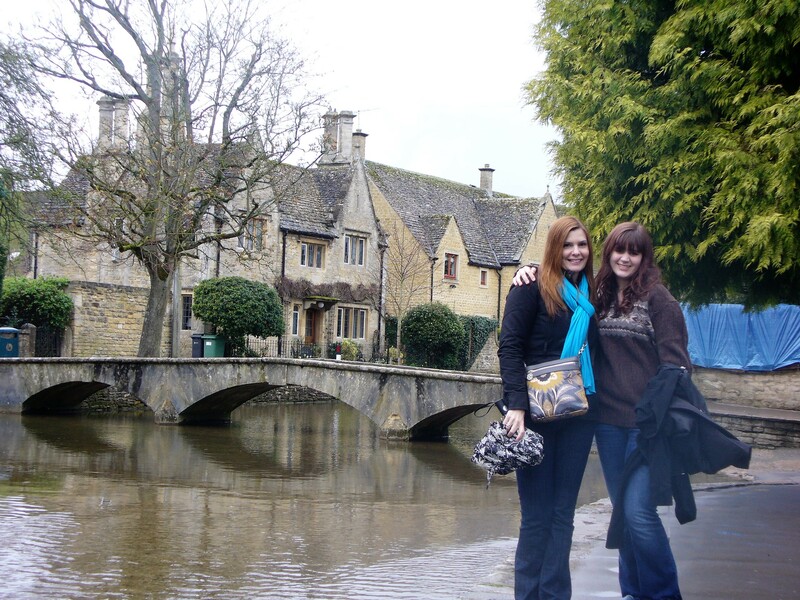 If you do go to the Cotswolds, don’t miss Bourton-On-The-Water. It’s a quintessential English village and very charming. Thank you for your kind words about my post. I’m glad you had fun on your trip even though it was not a balmy 75 or 80. least it calmed down for a bit Your pictures looks stunning. 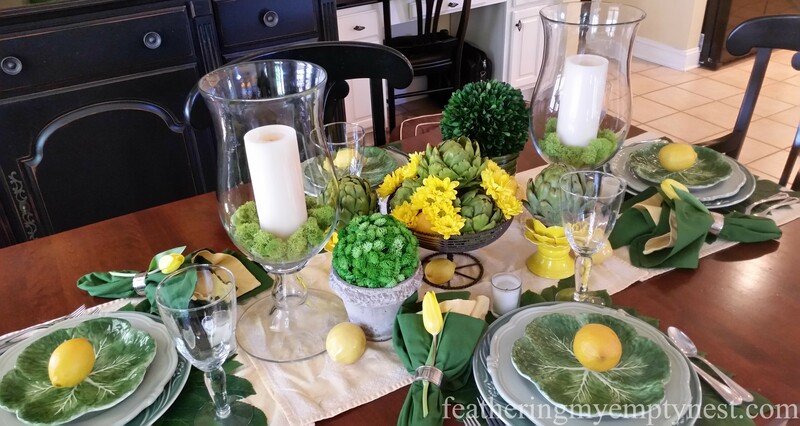 I am loving your tablescape too, the greens and yellows just pop. You did a beautiful job. 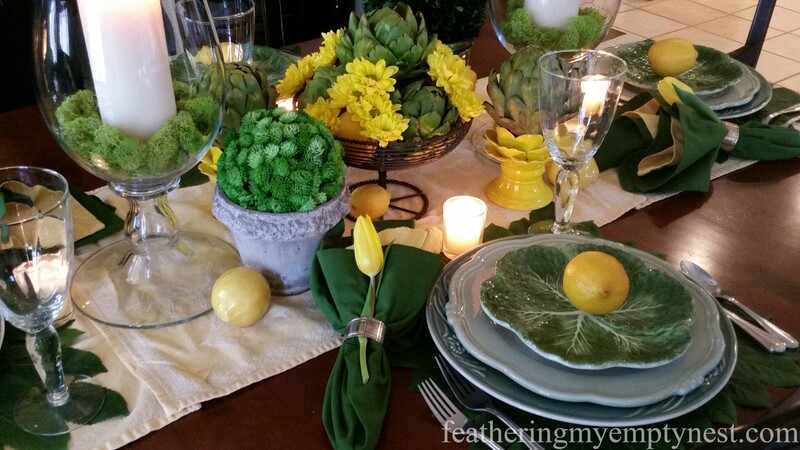 Thank you so much for your comment on my Lemon Tablescape. I hope you have a great weekend as well.